Sally Rudd is a decision analyst and facilitator at Compass Resource Management based in Vancouver, British Columbia. Compass specializes in the use of structured decision making to support collaborative decision making processes and has applied structured decision making in combination with adaptive management across many of their projects both in Canada and the US. Sally Rudd is currently working with the Collaborative Science and Adaptive Management Program or CSAMP here in the Delta to apply structured decision making to help inform decisions around Delta smelt. 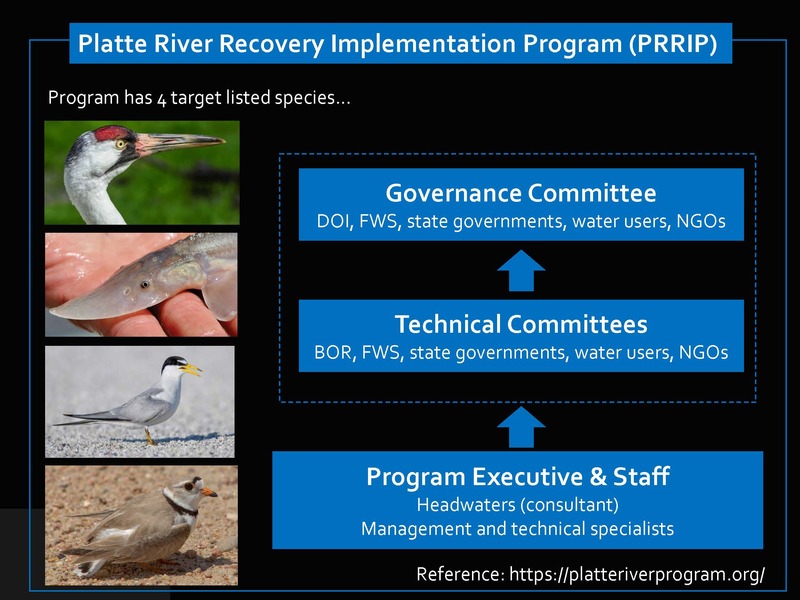 In this presentation, Ms. Rudd briefly describes the basics of structured decision making and shares insights from Compass’s use of structured decision making in the Platte River and on the Missouri River. 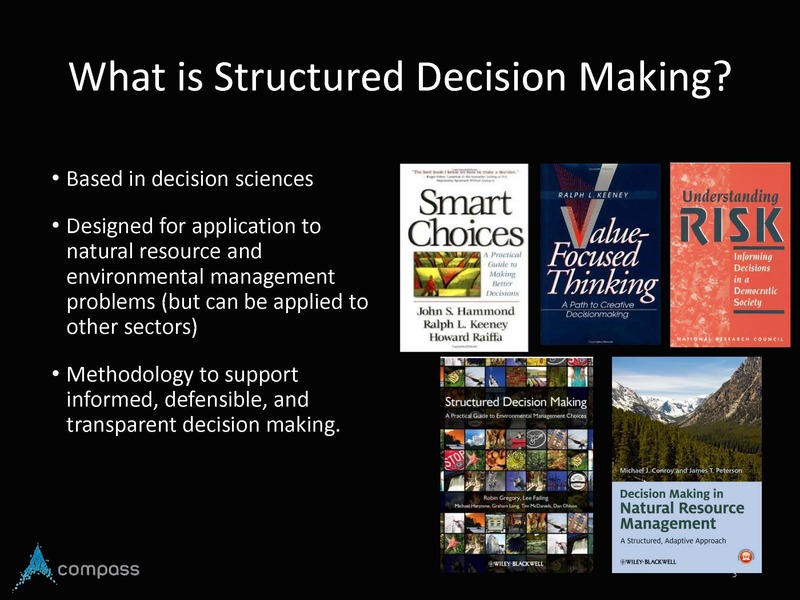 Structured decision was developed in the 1990s to apply the tools and theory from the decision sciences to environmental and resource management problems. As a methodology, it consists of processes, tools, and techniques to support making informed, defensible, and transparent decisions. Ms. Rudd noted that Compass defines a good decision as one that is informed by the best available knowledge, is defensible so that it can stand up to public and technical scrutiny, and is transparent in the sense that you can see exactly what the information is and the value based trade-offs that were considered within the decision process. Step 2. Define decision objectives. It’s key to state everything that is important to be considering in your given decision, as the decision objectives are used to develop alternatives. The steps are a framework for groups to work together, creating the common vocabulary and road map, so people know when they are identifying their objectives, when they are developing alternatives, when it’s a technical task to use science for the best characterization of consequences, and when it’s time to talk about values and what’s important. Is a tradeoff on one objective worth it? 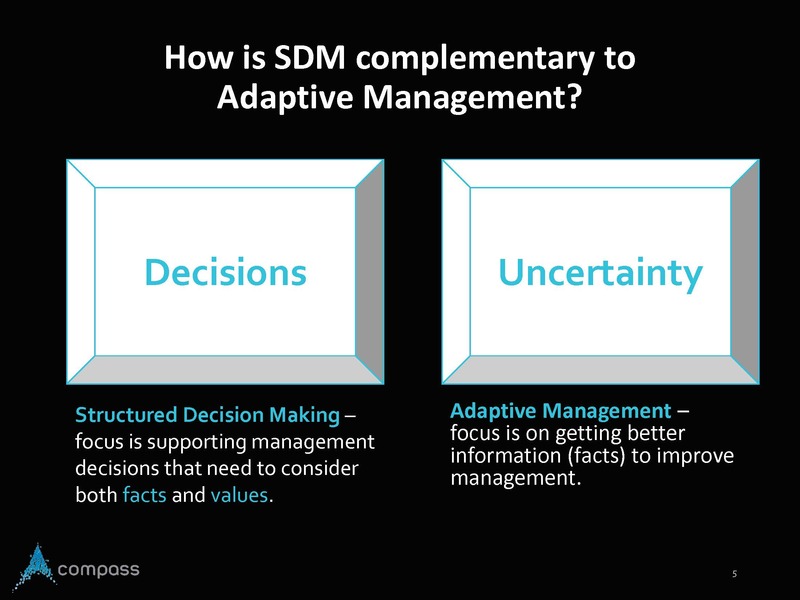 How is structured decision making complementary to adaptive management? 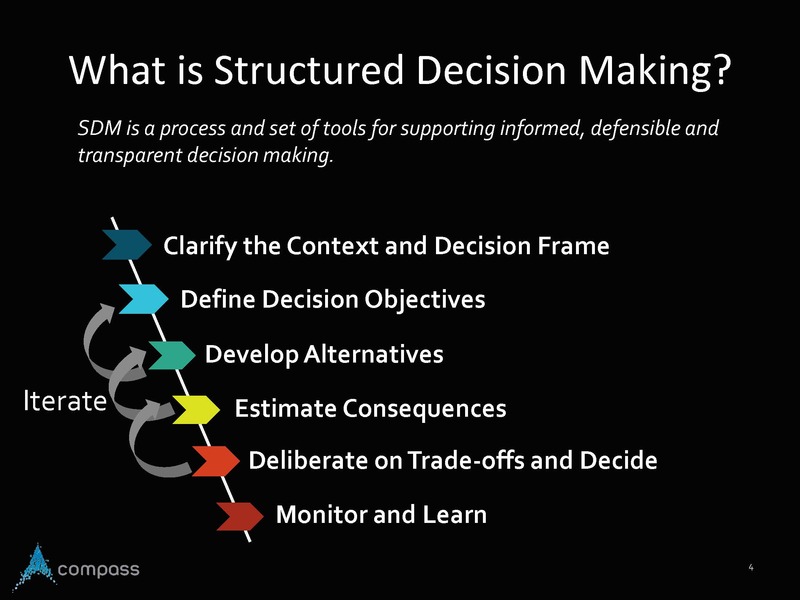 In structured decision making, the focus is on decisions and in particular management decisions that need to consider both facts and values, so a decision needs to be value based in terms of considering what you care about and what’s important as well as science based, considering what you know and what you don’t know. 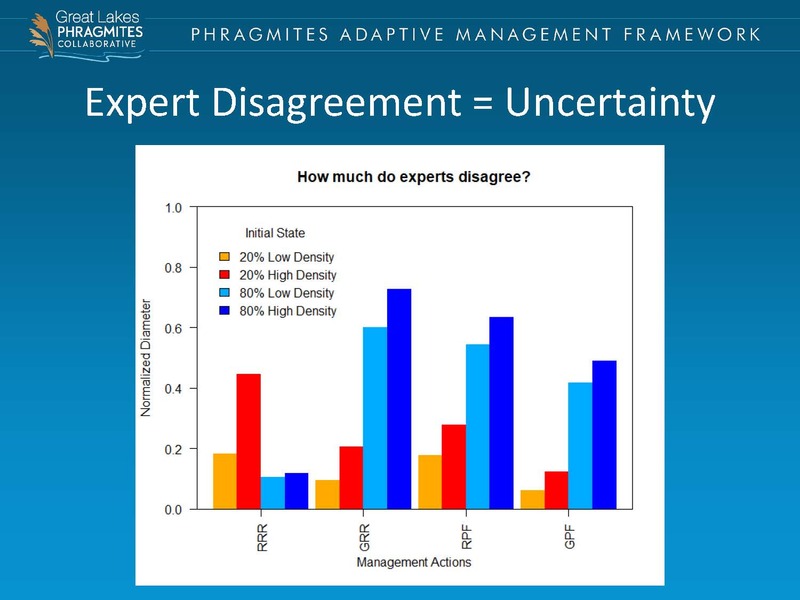 However, adaptive management is focused on resolving uncertainties so that we can better understand how to effectively advance our management objectives, so adaptive management is more about getting more facts, she said. 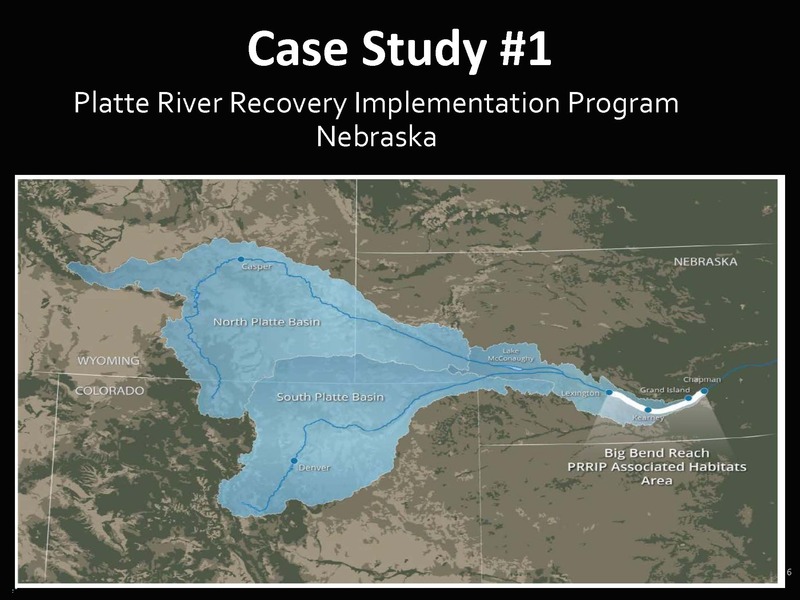 Ms. Rudd then discussed a case study from Nebraska’s Platte River Recovery Implementation Program. Initiated in 2007, the program is a cooperative effort between the Department of the Interior, the states of Colorado, Wyoming, Nebraska, water users, land users, and environmental NGOs. The purpose of the program is to use its program resources to benefit four listed species: whooping crane, pallid sturgeon, interior least tern, and piping plover. 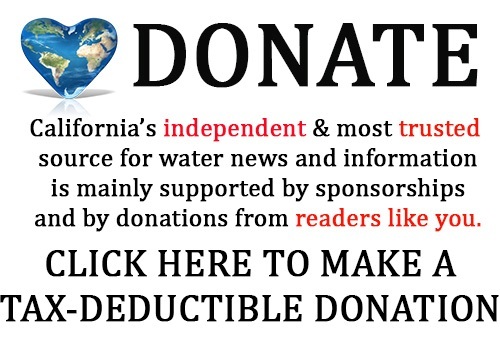 Since there is a finite amount of money, water, and land, they are trying to optimize how they use those resources to best benefit those species while also considering the interests of the water users and land users involved in the program. 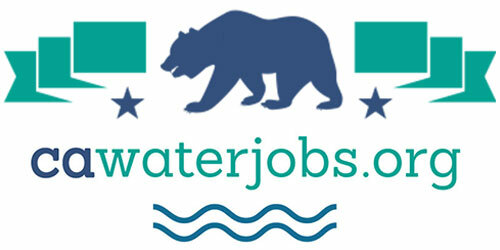 The program has a governance committee with the members from the Department of the Interior, Fish and Wildlife Service, state governments, water users, and NGOs who work by consensus on all of their decisions. They are informed by several technical committees that are also staffed by the member organizations represented on the governance committee who come to consensus on the technical information before it goes to the governance committee. There is a program executive and staff which are extremely helpful to support that whole committee structure. Headwaters is a consulting group providing adaptive management and technical expertise. 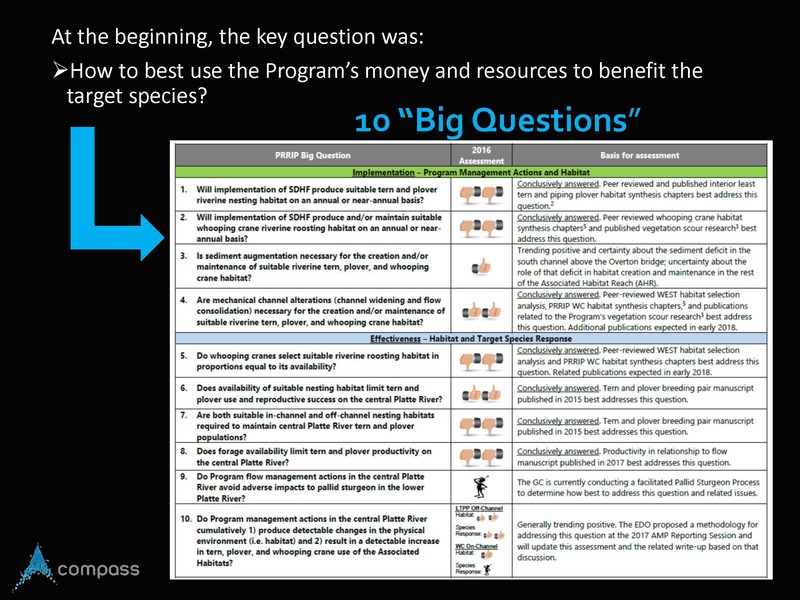 When the program began in 2007, it was really not clear how to best use the program’s resources to best benefit those target species. There were hundreds of hypotheses around how to benefit those species, so they decided to organize them into ten big questions to focus research and experiments. The slide shows an image from their 2016 report card which is a snapshot summary of their progress on answering the ten big questions with two thumbs up if they’ve answered the question in the affirmative and two thumbs down if its otherwise. Ms. Rudd then presented a slide showing the standard adaptive management cycle to work through those big questions, notated by the steps of how they worked through one pass of this cycle over a roughly 7-year period. 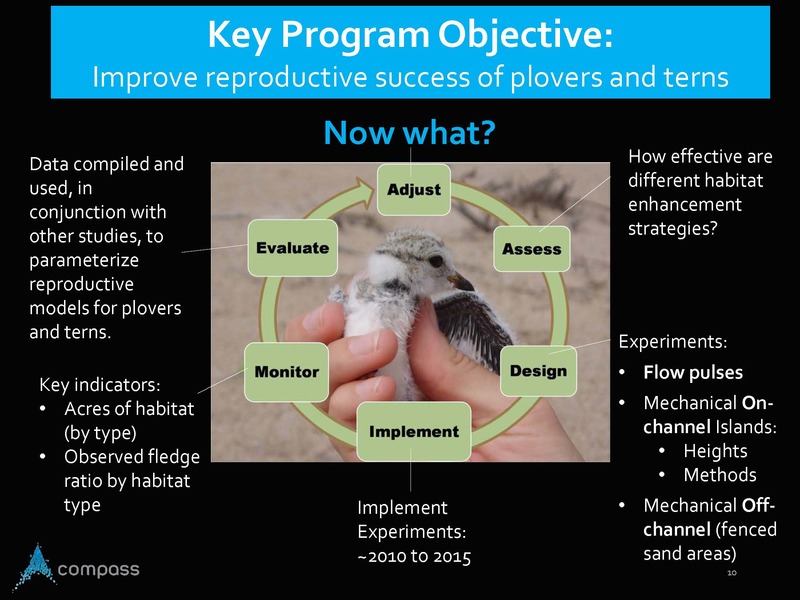 In this example, the objective was how to best improve reproductive success for plovers and terns. They started with a general statement of what they were trying to do which was figure out how effective are different habitat enhancement strategies for improving reproductive success of plovers and terns. She noted that there are several hypotheses and big questions associated with that. For experiments, they designed some short duration high-flow pulses and they built in-channel islands of different heights and with different methods as well as habitat off channel, which was basically fenced sand areas that could protect the birds from predators. They implemented and monitored those experiments over about six years. Once they got to the adjust step, they realized they didn’t really know what to do. The consulting group that supports the committee knew that some members of the governance committee had fairly strong perspectives on what their preferred methods were in terms of whether the habitat would be on-channel or off-channel. At this point, Ms. Rudd said that it looked like flow pulses were a very poor performer, so that was fairly obvious that they were going to be taking that off the table. It wasn’t apparent how the governance committee would come to an agreement on what strategy to use moving into the future, so Compass was brought in to design a structured decision making process for them. The process was framed around the management question of what’s the best combination of management actions to take over the next three years for the purpose of maintaining or enhancing habitat for terns and plovers. Within that decision frame and the various strategies that they were looking at included the possible objectives that could be influenced by the alternatives, which were numbers of plovers and terns, how much each alternative was going to cost, the potential to produce benefits for whooping cranes, the potential to have increased sediment supply, how much effort it would be to implement them, and what would be learned. This type of process produces a very transparent record of everything considered within the decision process, and why some alternatives were advanced over others, she noted. 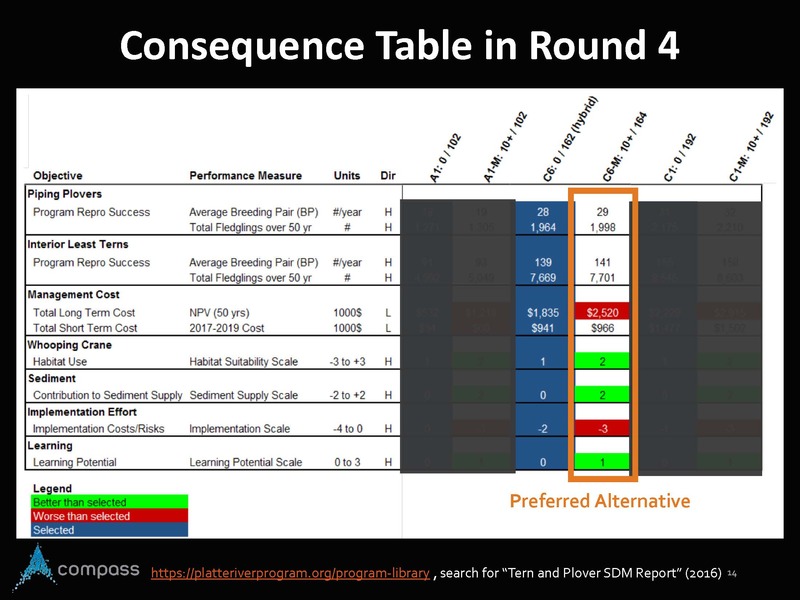 Ms. Rudd then presented the consequence table used in round 4, explaining that a consequence table is a key structuring and communication tool used in structured decision making that shows how each alternative performs compared to other alternatives with respect to the objectives. She noted that the objectives are listed in rows; each of those objectives is made more concrete and specific by assigning it a performance measure. They use their best knowledge of what they think the consequences are of each alternative are going to be for the objective. Management costs could also be quantified. For other objectives, there weren’t any models so they took a lines-of-evidence approach with the technical committees. In the round four deliberations, the governance committee decided that four alternatives were inferior. The green and red are used to show where the performance is either better or worse than the selected alternative in blue, which then highlights the key trade-offs. The second case study is from the Missouri River. Ms. Rudd acknowledged she was not the lead for this particular project, so this will be a broad narrative example of their work. The Missouri River drains one-sixth of the mainland of the United States. The US Army Corps of Engineers operates three of the largest dam structures in the world in this basin, alongside three others. 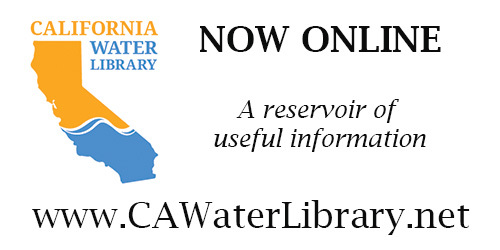 The dams and reservoirs are managed for a range of human water uses such as navigation, flood protection, recreation, hydropower, and agriculture. The Missouri River is similar to that Platte River in that it is also habitat to three endangered species: pallid sturgeon, piping plover, and interior least tern. Ms. Rudd noted that the Platte River drains into the Missouri River. Since 2000, the US Army Corps has been challenged to come up with a way to avoid a determination of jeopardy by the US FWS for pallid sturgeon, which had become a listed species. The challenge was that there are deep uncertainties of how to change dam operations to enhance habitat for pallid sturgeon, and any change in the dam operations is likely to result in significant impacts across all of the human water users. 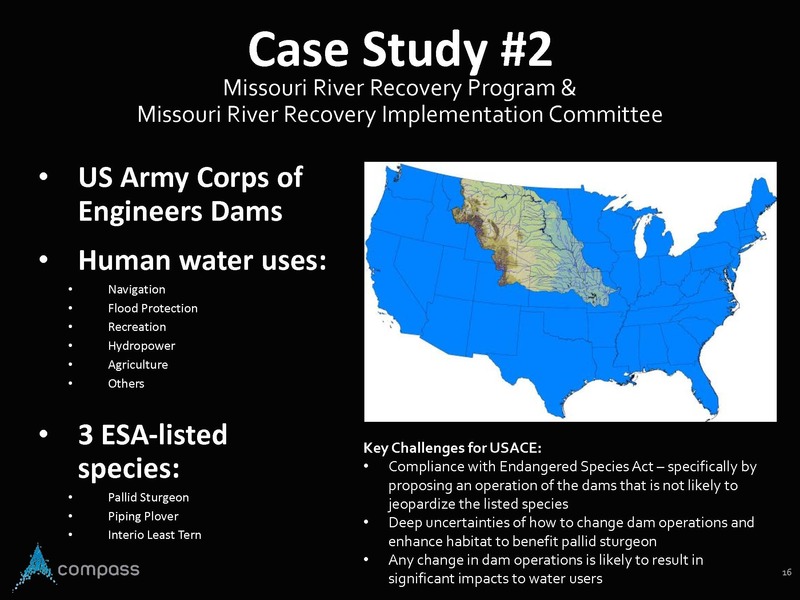 The Army Corps and all of the stakeholders involved wanted to find solutions that would work for the species and the water users, so this led to the Army Corps to form the Missouri River Recovery Program in 2005, which is a program to coordinate their efforts to comply with the Endangered Species Act and other federal laws like the National Environmental Protection Act. They also formed the Missouri River Recovery Implementation Committee, which is a large committee comprised of 28 stakeholders, 8 states, 18 tribes, and 15 federal agencies that provide input into the Army Corps’ planning processes. Compass has been working with them since about 2014 as a structured decision making advisor. 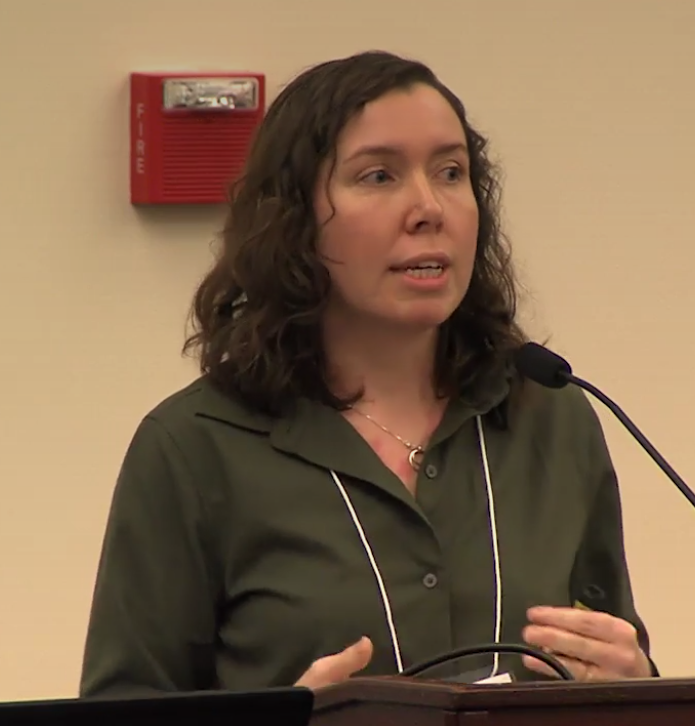 Ms. Rudd shared one aspect of the work that was used to inform the development of a proposed action in the Army Corps 2017 biological assessment. The Fish and Wildlife Service accepted that proposed action and in 2018, the Army Corps received a no jeopardy determination from the FWS which was their objective since 2000. Ms. Rudd said it took about two years to get to the step with the final consequence table. In the rows are the objectives and at the top are the species objectives. For the pallid sturgeon, the performance measure is addressing the critical effect hypotheses for the pallid; she noted that they had done a lot of science to be able to narrow in on what they thought were the most critical effect hypotheses for pallid sturgeon reproduction and that was the key point in the life cycle that they thought they had to focus on. They were able to identify these hypotheses, but they did not have the information to estimate the consequences of various management strategies on pallid sturgeon reproduction. So all they could do was ask the question whether they thought if the hypothesis was true and that it is limiting reproduction, would this alternative help? Below that, they are looking at impacts for all of the other water users; the red and green shading show the performance of each alternative against the objectives, compared to a reference alternative which was the business as usual approach going forward. Alternative 2 was the full implementation of the Reasonable and Prudent Alternatives in the 2003 biop from the US FWS, and while that alternative did address all those critical effect hypotheses, it would result in significant impacts to land and water users and it would be very expensive to implement; and in fact, the RPA was actually never fully implemented from 2003 onwards. Alternative 3 is mechanical building of habitat that would not use any flow; Alternative 4 is large scale spring pulses, Alternative 5 a fall pulse, and Alternative 6 a spawning cue pulse. “As a whole, using structured decision making and adaptive management together to make quite a robust management cycle and a vocabulary for multi-disciplinary teams and decision makers and technical people all working together in a constructive forward moving process,” she concluded. Dr. Kurt Kowalski is a wetland ecologist from the USGS Great Lakes Science Center in Ann Arbor, Michigan who has studied the diked and coastal marshes of the Great Lakes for many years. He also works with collaborators around the country to find new management approaches for invasive plants. 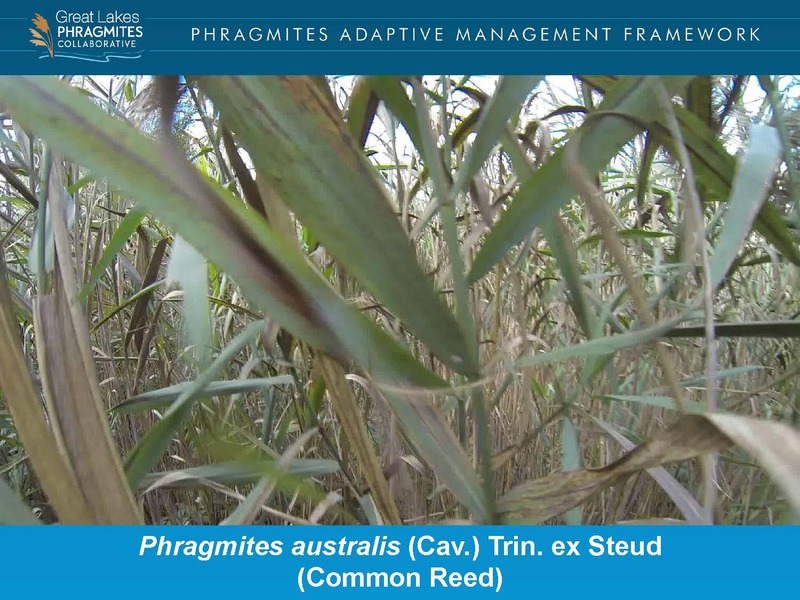 In this presentation, he discussed the international collaborative and adaptive management framework that has developed to manage invasive phragmites (a perennial wetland grass) in the Great Lakes Basin. Dr. Kurt Kowalski began by noting that the USGS Great Lakes Science Center focuses on ecological issues for the entire Great Lakes Basin and the over 10,000 miles of shoreline around the lakes, which is equivalent to all the marine coasts put together in the contiguous 48 states. There are riverine systems, delta, coastal wetlands, dunes, and beaches; it is also an area where a lot of people live. In this presentation, he will be speaking about the Great Lakes Phragmites Collaborative and the Phragmites Adaptive Management Framework, which is a program to control non-native phragmites australis. Phragmites are a perennial annual grass that can grow up to 15 meters tall; it flourishes in wet areas, such as wetlands, ditches, marinas, and shorelines. It’s a robust plant, reproducing through a big seed head as well as a whole lot of below ground biomass. It grows very tall and the leaves intercept the light through the canopy, so it crowds out the more desirable native species. There are native phragmites in the Great Lakes, but it is the invasive phragmites from other areas that are the most problematic. The invasive phragmites cause numerous problems to ecosystems: they crowd out native plants, reduce biodiversity, make it difficult for wildlife or birds to land, and also impact humans and human uses by impeding recreation and being a fire hazard in the winter when it becomes tinder-dry. Due to all those factors, they have been gaining a lot of management attention in the Great Lakes as well as around the country. 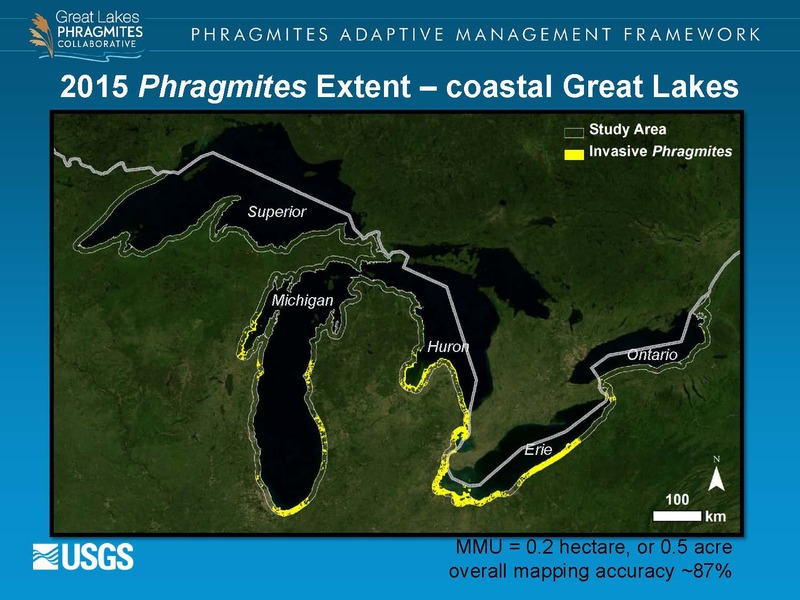 The collaborative worked with the Michigan Tech Research Institute to map out the extent of the invasive phragmites in the coastal zone, estimating about 60,000 acres of phragmites have already established in large stands, mostly in the Central Great Lakes. 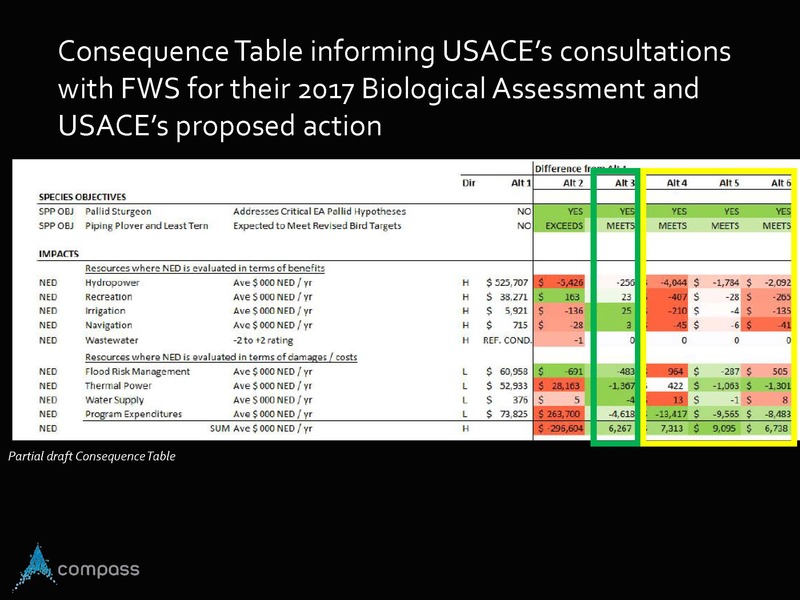 Dr. Kowalski noted that it’s a basin-wide issue, but they only looked at the coastal zone because that was all they had funding for. The reality is that it’s a North America problem and a big issue for many other areas. In the Great Lakes, they addressed the problem by creating the Great Lakes Phragmites Collaborative, which was initiated and stood up by the USGS and the Great Lakes Commission, and is being driven by the Great Lakes Restoration Initiative funding. 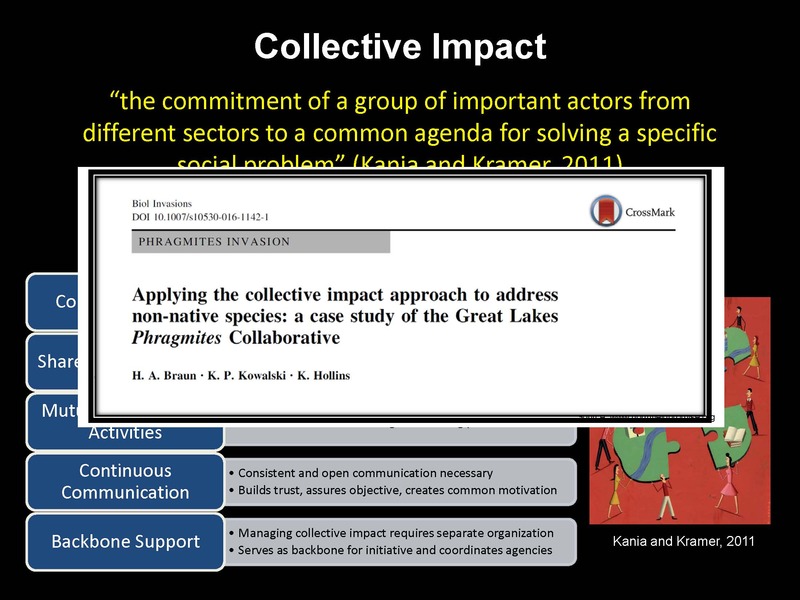 The Phragmites Collaborative is based on the idea of ‘collective impact’, which is defined as the commitment of a group of important actors from different sectors to a common agenda for solving a specific social problem. It essentially takes collaboration to a new level by setting out tenets needed in order to achieve a collective impact of an action, including a common agenda and goals, shared measurements, and accountability for achieving the conservation objectives that are being addressed. A backbone agency or entity is needed to keep driving the process forward. 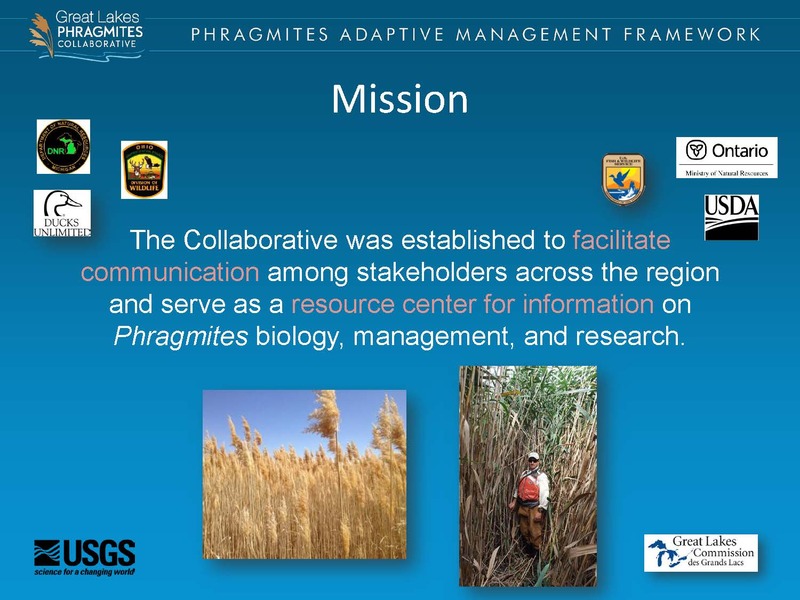 In terms of the governance structure, the Great Lakes Phragmites Collaborative has a core team that provides administrative and strategic guidance to the collaborative. There is an advisory committee comprised of volunteers from federal agencies, state agencies, provincial entities, non-profits, academia, and others representing the various interests in this issue. As a group, they worked together to identify the mission of the collaborative, which is defined as ‘to facilitate communication among stakeholders across the region and serve as a resource center for information on Phragmites biology, management, and research.’ The group also identified the resources that were needed. 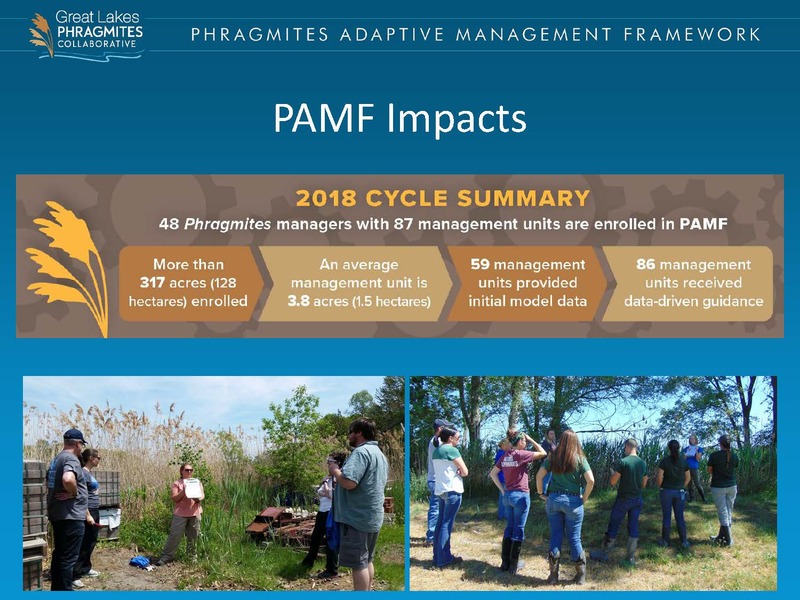 The phragmites collaborative began in 2011, and since then, they have collected a tremendous amount of resources on their webpage which includes mapping tools, research articles, and access to webinars that communicate science to managers and policy makers. 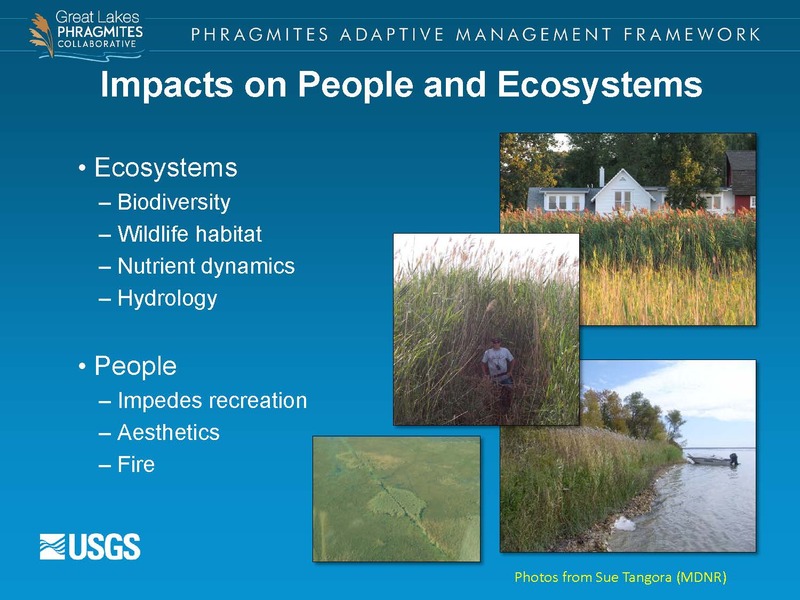 “These have all been identified by the stakeholders and have helped moved the issue forward, so I encourage you to go and check out our webpage at https://www.greatlakesphragmites.net as it really conveys what the collaborative is trying to do for phragmites,” he said. The PAMF has a core team, but only the program coordinator is full-time. There is a technical working group that defined the core questions and the uncertainties that needed to be resolved. 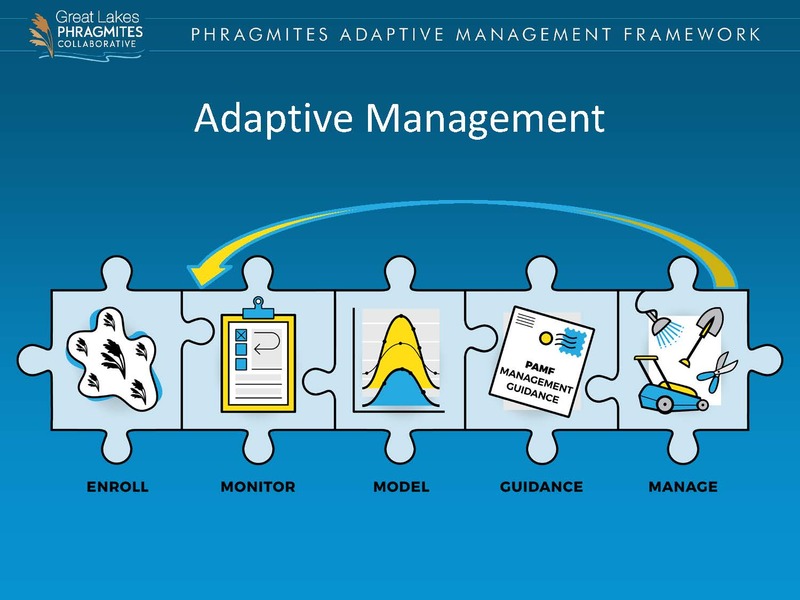 They structured PAMF from the adaptive management documents put together by the Department of Interior which lay out what adaptive management is and the steps to follow. 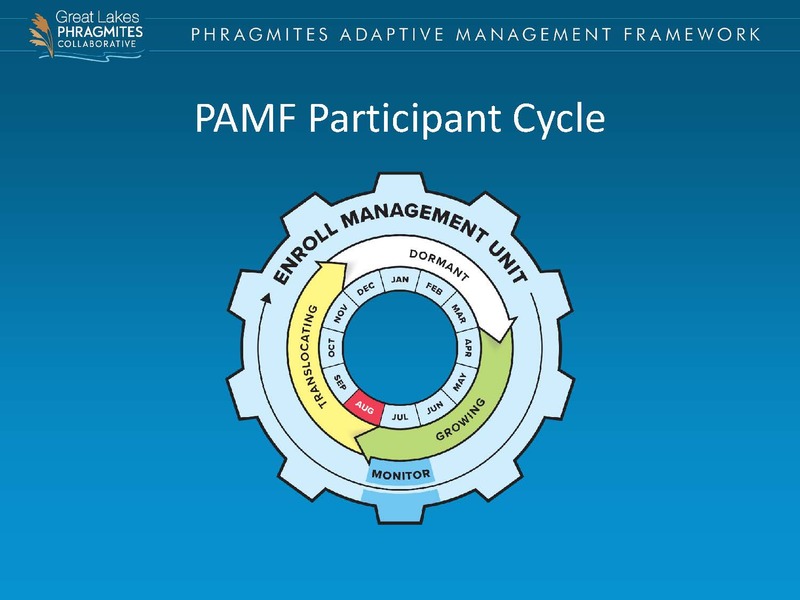 Dr. Kowalski explained how the way PAMF works: People must first enroll. They then monitor and enter the data into a model that learns from the data. The model produces guidance output for the manager or landowner who performs the actions as per the guidance. They monitor again to learn what outcome came from that management action; that information is put into the model which then teaches the model and the program moves forward. He presented a graph with the colors showing the different management actions. What’s important here is the y axis, he said; the higher up you go, the more uncertainty there is. “This is the uncertainty that we are hoping to be addressing in PAMF,” he said. Dr. Kowalski presented their version of the circle, noting that there are multiple rings. The inside ring shows the months of the year. 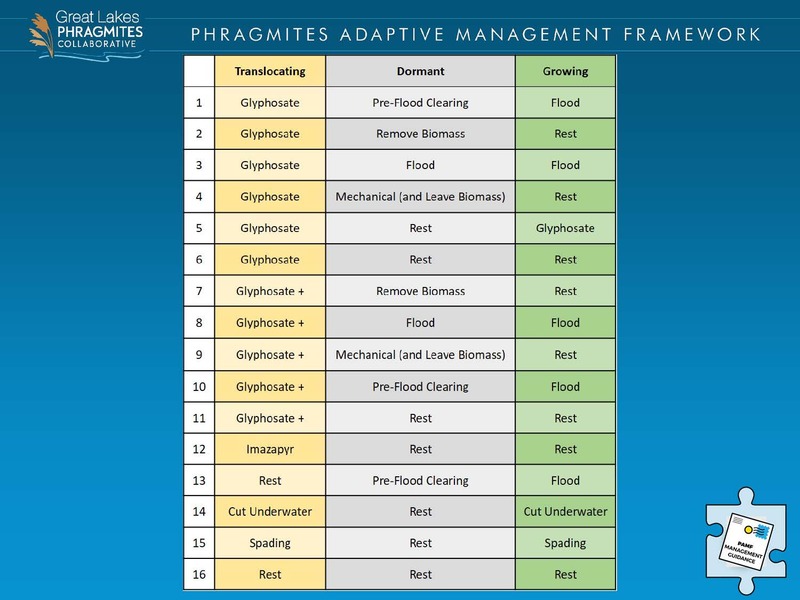 The next ring out are the corresponding phases of the plan: phragmites actively grow from April through July-August; it then goes into the translocating phase, and then dormant phase. The outer phase is the management enrolling stage; people can enroll anytime of the year with just some basic information on the area they are trying to manage. In August, guidance is issued to the enrollees; the guidance might be collect the seeding in the translocating season, proof flood clearing, and then flooding in the spring, he said. At one time, there were hundreds of different management options or treatment combinations that PAMF is working to resolve, but the technical advisory committee whittled it down to sixteen that they are working with to figure out which is most effective, given the site conditions. These treatments include different herbicides, spading or cutting just underneath the surface, as well as resting or doing nothing which is also a management action. The guidance gives the optimal treatment, and then other options if they can’t or choose not to do the optimal treatment. The participants monitor again in July and get those data back into the system to see the ecological response of their management action and teach the model. Entering the data through time is what will iterate and teach the model, reduce the uncertainties within the model and make better data-driven recommendations. As the program gains more participants, there will be more data to teach the model and improve. The program is off to a good start and has been well received by stakeholders and participants. Currently, there are 48 managers with 87 different management units because one manager can have multiple management units. 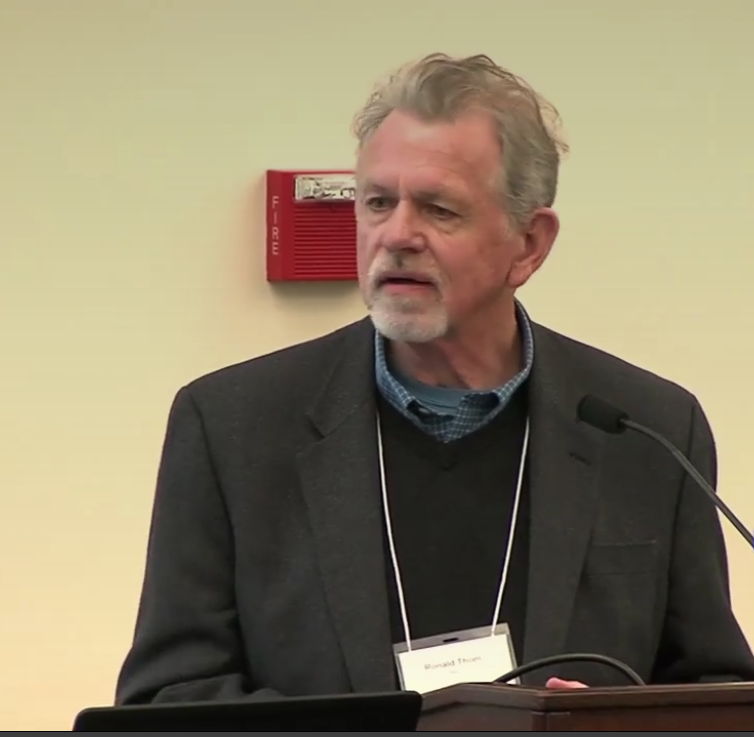 Dr. Ron Thom is a staff scientist emeritus from the Marine Science Laboratory of the Pacific Northwest National Laboratory in Washington. He has conducted research and monitoring in coastal and estuarine ecosystems since 1971, including research on ecosystem restoration, benthic primary production, climate change, and ecology of fisheries resources. Currently he serves as senior science advisory to the Puget Sound partnership as the Governor’s appointee to the Northwest States Marine Conservation Initiative, and as president of the Washington State Academy of Sciences. 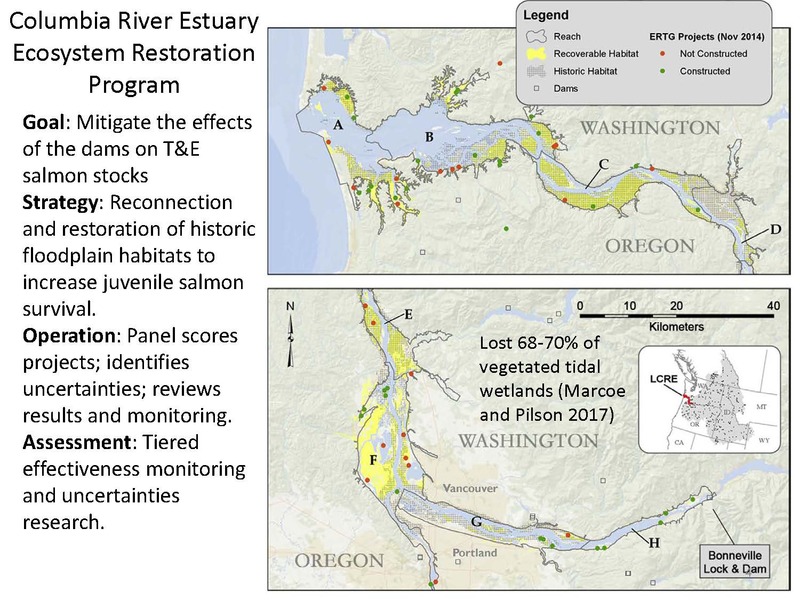 Since 2009, Dr. Thom has been a member of the technical group, the Columbia Estuary Ecosystem Restoration Program, and in this presentation, he discussed how the program utilizes a scoring system to evaluate restoration projects. What do we need to do where, when and why to achieve the goals? Is there an organizing model? How certain are we about what needs to be done, where and why? What are the critical scientific uncertainties? How will we know if the actions are effective in meeting the goals? What do we need to measure, when, where and why? How long do we need to measure things? How will we accumulate and report information to address action effectiveness? How are decisions made to adjust actions to be more effective? Who makes these decisions? How often are decisions made? The Columbia River estuary is 239 miles long, extending from Bonneville Dam to the mouth of the Pacific Ocean; it’s tidal for about 60 kilometers up the river. The letters indicate biological and geomorphological sections of the system. 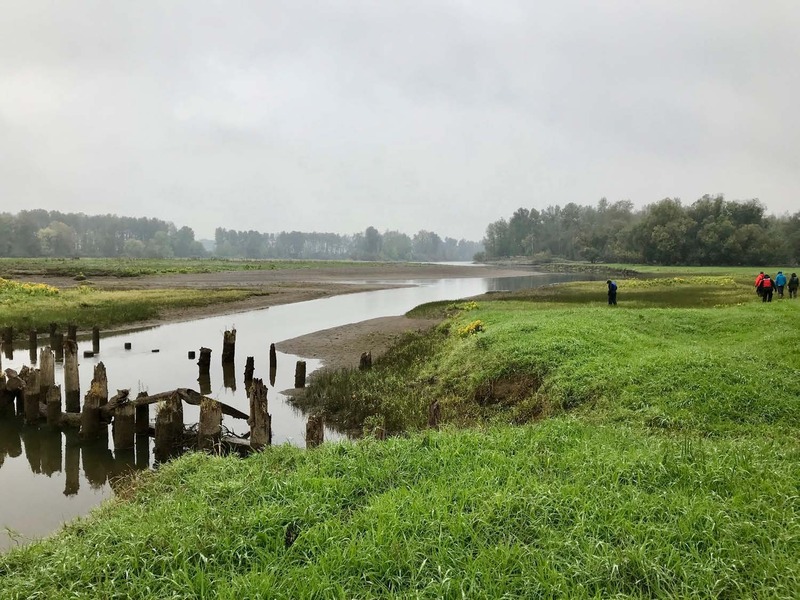 The goal of the Columbia River Estuary Ecosystem Restoration Program is to mitigate the effects of the dams on threatened and endangered salmonids by reconnecting and restoring the historic floodplain habitats to defragment the system. The program’s operations involves a panel that scores projects that are brought to it, identifies uncertainties, and reviews results of monitoring and assessments. The system has lost about 70% of the vegetated tidal wetlands. The current estimate now is that about 52,000 acres of wetlands are potentially recoverable. Those areas potentially recoverable are shown in red on the map; some would take more effort than others, said Dr. Thom. The purpose of the program is to mitigate the effects of the dams on salmonids with the focus on increasing the fitness of juvenile salmon before they get out into the ocean. Initial actions involved modifications of the Upper Columbia and at the dams to reduce juvenile mortality. What kind of actions and how much restoration is needed to produce a detectable response is a tough question. Dr. Thom said he only knew of two other places where that question has been addressed, and both were more manageable systems. 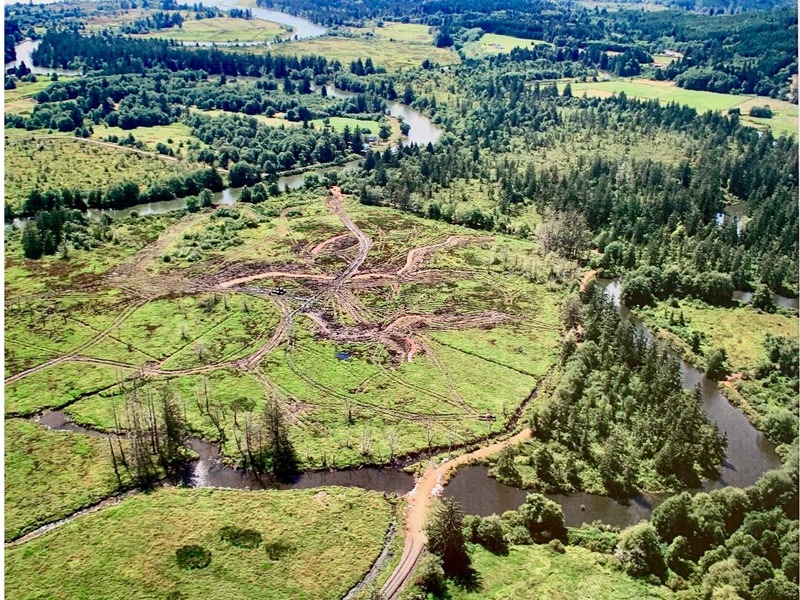 One of those is the Salmon River in Oregon where they found that when they restored 70% of the wetlands, they finally saw a signal in the adult returns for coho salmon. 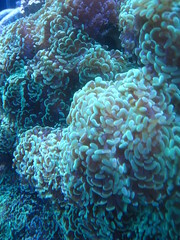 It takes a long time because they are out there in the ocean for 2 or 3 or 4 years, so there is a big uncertainty. The specific problems the program is addressing are the loss of wetlands for rearing and feeding, and loss of marsh macro detritus input into the estuary. Dr. Thom explained that the levees removed the marsh macrodetritus input to the estuary and that switched the food web from marsh macrodetritus-based food web to one based on plankton produced above the dams in the reservoirs. The idea is to switch the food web back to what it was historically by restoring and defragmenting the floodplain to once again provide the macrodetritus input. The framework is a systematic adaptive management program that uses multiple types of actions, monitoring and research, and evidence-based analysis. These are many groups involved in the program. The Army Corps and the EPA are the funders; there are sponsors who design projects and bring them to the managers, there are several organizations involved in the monitoring, as well as research done by multiple groups. There is the Independent Science Advisory Board, which reviews the work and the scoring process. Other criteria include opportunity access, capacity/quality, and certainty for success. There are other attributes as well, such as natural process and landforms, proven methods, self-maintaining, risk of detrimental effects, project complexity, certainty for fish benefit, and risk of exotic invasives. Dr. Thom said that a project that provides a lot of benefits would score a 5; a project with few benefits would score a 1. He then stepped through the process for a project. The project proposal first comes from a sponsor and it goes to the steering committee for assessment; if it’s good, the steering committee asks for a template to be filled out which is the format for providing information that every project needs to begin the process. There is a site visit and a question and answer with the project proponent and then the project is given a preliminary score. If it scores low, they may ask for revisions. If it scores well, a preliminary SBU is calculated and the project then goes to the steering committee and the agencies to take a look at. Depending on the comments received from the steering committee and the agencies, the project is revised if necessary, and if approved, the project is constructed. After construction, there is a post-project review. 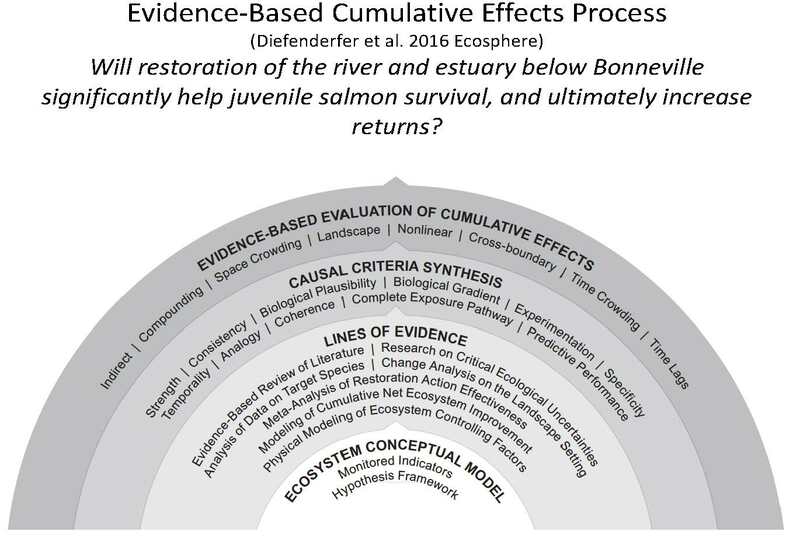 The Evidence-Based Cumulative Effects Process study tried to answer the question, will restoration of the river and estuary below Bonneville significantly help juvenile salmon survival, and ultimately increase returns? Dr. Thom said this study was the hardest thing he’s ever been involved with in his entire career; it took six years, a lot of field work, analysis, and modeling, and working with a lot of smart people. Almost every project gets monitored at some level, he said. The questions are, are the habitat-forming processes working, are the vegetation metrics coming up? 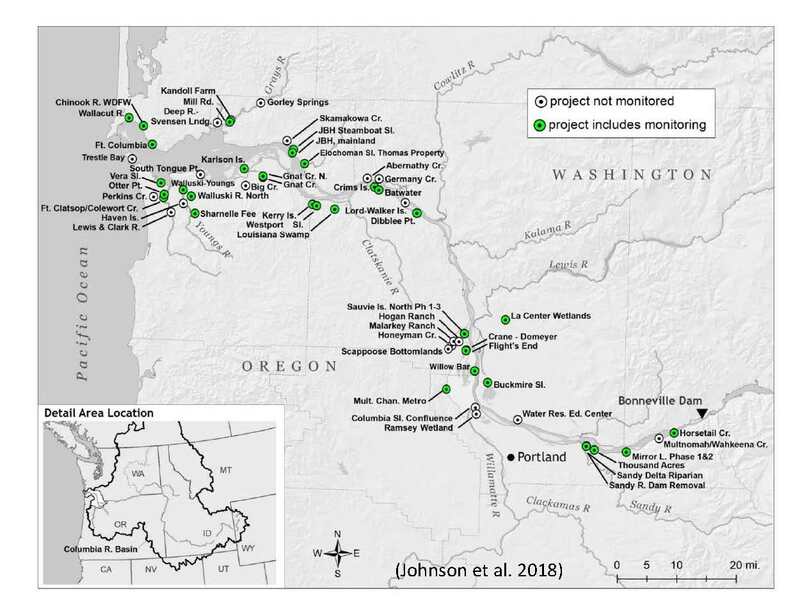 There are some projects that juvenile salmon are sampled at. The questions are more rigorous or difficult to answer at the system scale where they are considering migration rates of young salmon, the prey base, and growth hormones. There is also uncertainty research such as studies looking at the export of organic matter and prey out into the system, migration, fish benefit, and connectivity. The data is fed into a regional database, and a synthesis memo written every five years that looks at the management questions and what has been learned, which Dr. Thom said was extremely valuable. There’s a master matrix of learning that summarizes the learning for managers, periodic science seminars, and annual meetings with the stakeholders, sponsors, and regulators. Dr. Thom then concluded summarizing the new findings in the latest synthesis memo. The focus has been on large projects near the mainstem that will benefit all the salmon stocks coming down. 58 projects have restored about 5400 acres of tidal floodplain, which is in 11.6% increase in active wetland area over 12 years. There is a 2.5% increase in the habitat connectivity index, and monitoring indicated that actions were reestablishing ecological processes. Juvenile salmon were observed in all the thirteen sites where fish were monitored. The findings did not support the general paradigm that yearling-sized fish migrate rapidly through the estuary, feed little, and make little use of wetlands; rather, they found that they fed in the mainstem, inhabited the wetlands, and they grew. The limiting factors continue to be the spring freshet magnitude, insufficient habitat opportunity and capacity, non-native flora, and avian predation. There’s new data analysis and work being done on things like reed canarygrass control, building mounds to create some topography, channel network design, and putting large wood into these systems. Climate change impacts are being looked at. 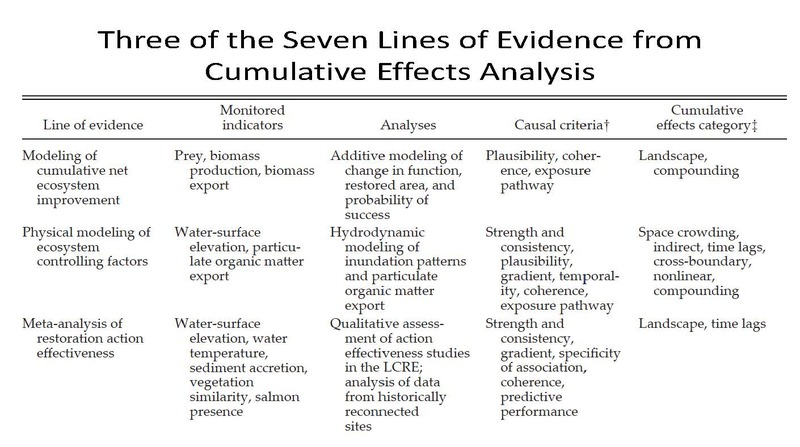 The data substantiated evidence-based evaluation of cumulative restoration effects. 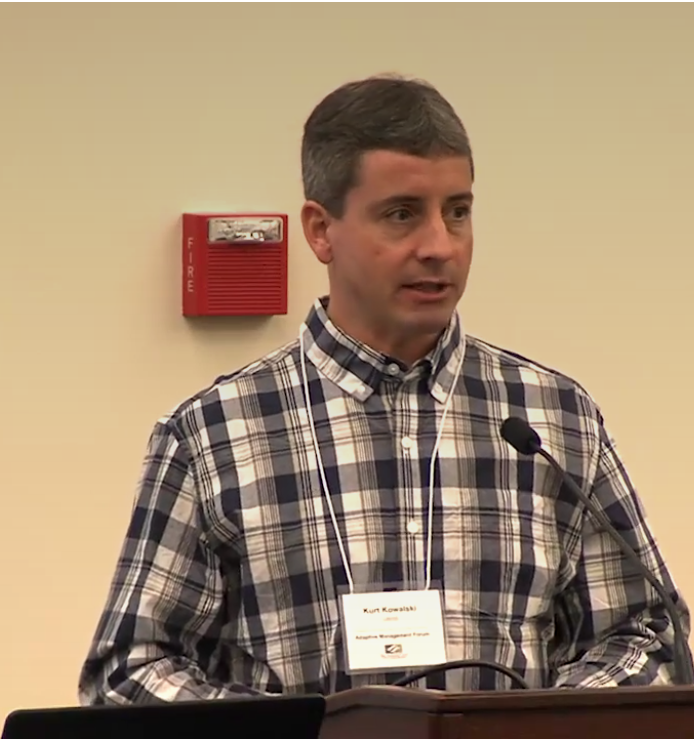 For part 1 of the Adaptive Management Forum, click here. Panel of project managers discuss how they apply adaptive management in their projects.